"Although this game picks up a few months after its predecessor, it is set in a parallel world where the events of the Innocent Sin did not happen. All of the characters from Innocent Sin are present, but they do not know each other. The central character this time is Maya, who reverts to a silent protagonist much like Tatsuya in the previous game. There are a total of seven playable characters, although two of them can not be recruited at the same time. They are Nate Nanjou and Ellen Kirishima, two returning playable characters from Revelations: Persona. New faces include Katsuya Suou, a by-the-book homicide investigator and older brother to Tatsuya; Ulala Serizawa (seen in Innocent Sin), Maya's lonely roommate who has a checkered history with men; and Baofu, a seedy criminal with veiled motives. The final character is Tatsuya, the sole person left who remembers what happened during the previous storyline. 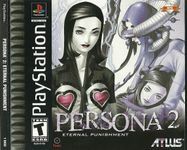 The plot of Eternal Punishment provides scattered flashbacks and references to both Revelations and Innocent Sin. Maya, an editor for fictional teen magazine Coolest, is caught up in the investigation of a bizarre series of murders committed by a serial killer known as the "JOKER". Victims reportedly receive a note stating "You're next!" from the JOKER before they die. While covering an assignment at Seven Sisters High School, a grisly murder brings Maya, her roommate, and a Police Detective together to solve the mystery of the JOKER murders." Source: Wikipedia, "Persona_2," available under the CC-BY-SA License.